Foxy DuBois is on a mission to get rich quick. Only one thing stands in her way - Alphonso the Alligator! Can Foxy’s hair-brained schemes make enough money to keep Alphonso fed? Or will Foxy DuBois find herself on the menu? An hilarious new series for young readers from an award-winning author-illustrator team. Alex’s first fiction series - Claude - was selected for the Richard and Judy Children’s Book Club 2011 and the Waterstone’s Children’s Book Prize. Caryl has been shortlisted for the Red House Award and won many awards including the Stockport Award. 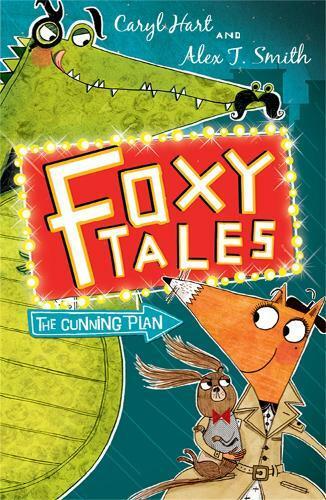 Young readers will have lots of fun reading this crazy, laugh-out-loud adventure starring Foxy Dubois (the fox) and Alphonso (the alligator) and the outlandish population of the bustling town of Vaudeville. This zany, slap stick comedy has it all: hare-brained get-rich-quick schemes, which inevitably go awry; alligator dress-ups with make-up; pet abductions with incredible chase scenes; and even alligator gas (from gorging on hot dogs)! If you’re on the lookout for a page-turning, madcap adventure, filled with wonderfully quirky illustrations for young readers, you’ll find it in The Cunning Plan. And even more exciting, it’s the first in a new series so there are more to look forward to. The creator of the much-loved Claude books (also for young readers) has done it again! Highly recommended for younger readers aged 6 and up.